On Saturday 1st December we welcome Briggait based charity Refuweegee to Etsy Made Local who will be collecting for the charity on the day. Here’s a little bit from themselves about their mission and their charity. “Refuweegee is a local charity with a global mission. Aiming to challenge and change the perception and reception of forcibly displaced people around the world. Refuweegee provide community built welcome packs to recently arrived refugees. 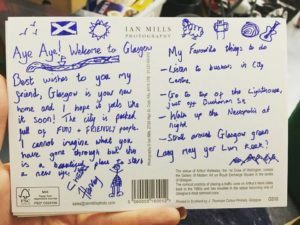 They work with multiple partner organisations to ensure that the welcome packs are useful, full of Glasgow character and each pack is personalised with a ‘letter fae a local’. These are welcome letters written by the existing population from in and around the city. 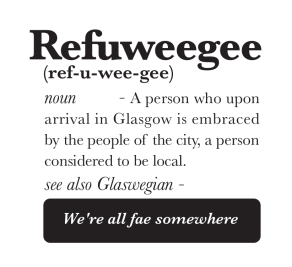 In addition Refuweegee work with the refugee community to build links between old and new communities and to raise awareness of their situation both in Glasgow and abroad. Previous events and projects have included a photography exhibition of letters to and from recently arrived individuals, a photo storytelling project called Claiming Back the Narrative, which has been exhibited in Edinburgh and Glasgow; the recording of the album Flight, which was inspired by the‘letters fae the locals’ and includes original pieces of music from local musicians; ensuring that the refugee community have access to existing events and taking groups to gigs at Glasgow Barrowlands and Scottish music festivals – Solas and Mugstock. 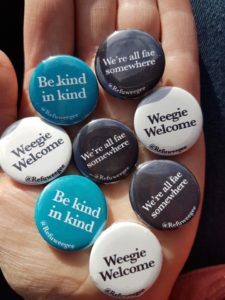 Refuweegee provide people in Glasgow with multiple ways to support the refugee ‘crisis’ and to engage with forcibly displaced individuals; including the provision of volunteer opportunities for both old and new residents of the city and beyond.